To summarize the predictions from the Farmers Almanac, the East will have very wet and stormy conditions with above average temperatures and a lot of wet snow. This forecast will also apply to the Eastern Great Lakes and the Southern Plains. Below normal temperatures will dominate the Northern Plains and the Western Great Lakes, while the rest of the country will have a normal winter except for the Southeast which will very mild and wet. So, with the upcoming winter predicted to be “an unusually tough one” for most of the country, how should we plan our Christmas decorating. One suggestion is to bring some of your outdoor decorating inside. A beautiful and inspiring alternative to our many Life Size Decorations and Outdoor Nativity Sets, Scenes and Creches is our Life Size Indoor Nativity Sets and Scenes. Designed and fabricated in the Philippines by skilled designers and crafts people who are also devout Christians, these unique resin and fabric and plush figures will help you celebrate the true meaning of Christmas and will offer your church an attractive alternative to the Nativity display. Regardless of the weather predictions, many people will still set up beautiful outdoor displays. We suggest that you be sure to tether your taller figures and displays to the ground with posts and guy wires to ensure they are not toppled by high winds and wet snow. Clean the snow off your figures and spotlights and try to ensure that you painted fiberglass and resin figures don’t get frozen in or are left in standing water as this amt induce cracking and chipping of the paint. When you bring your figures and displays in at the end of the season, be sure to wipe them with a damp cloth without using detergent or liquid cleaner. Do not power wash any painted fiberglass or resin figure as this can strip the paint from the surface. The Christmas Season is a glorious time of year for children, families and Christians of all churches to celebrate. A little advance planning can make your decorating less stressful. 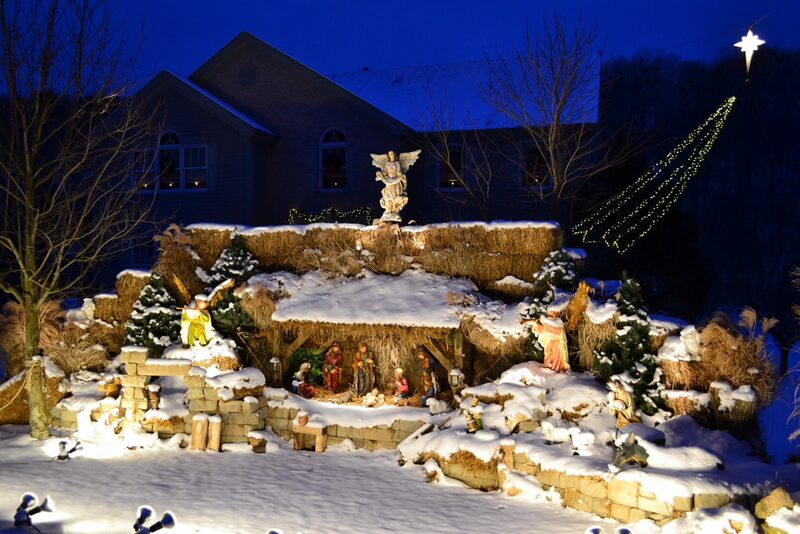 Next PostNext Outdoor Nativity and Christmas Displays – How Early Is Too Early?